Little by little, Ma Thi Thi Cho has created something big. Getting married should be a joyous occasion for a young couple. But for Ma Thi Thi Cho and her husband U Phoe Htaw, the moment was bittersweet. All the newlyweds had to their name was a small, thatched bamboo house and they could see their earnings from seasonal farm work would never be enough to support a young family. It wasn’t long before U Phoe Htaw decided he had to leave his wife in Shwe Bone Thar, a Pa’O village in Shan State, to look for work in the notorious jade mines of Hpakant, hundreds of kilometers to the north. 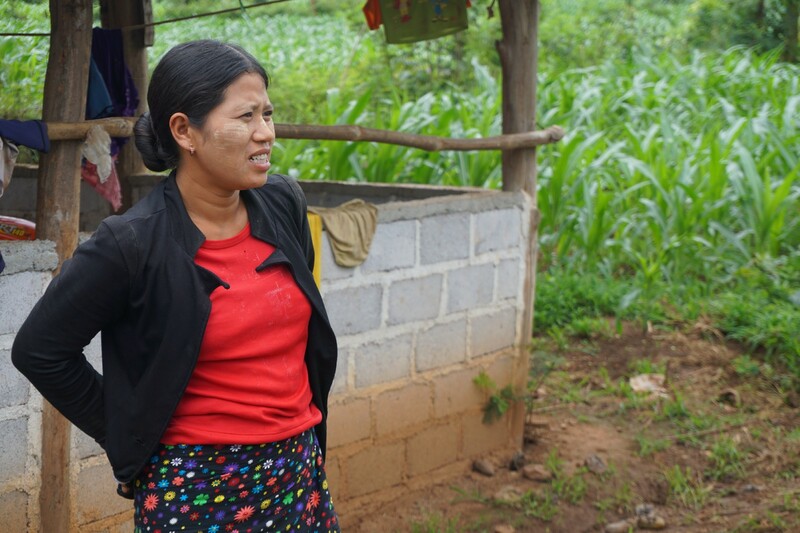 Ma Thi Thi Cho knew that it would be difficult to raise a family off their small, seasonal income. Ma Thi Thi Cho was sad but not defeated. Over the next few years, she managed to save enough of the money her husband had sent her to buy a six-acre plot of land near their home. Having a piece of land on which to farm was just half of the battle. She needed capital to pay for labor, corn seed and fertilizer. With few options at hand, she turned to local corn brokers who agreed to lend her the money only if she sold her produce back to them at well below the market rate. It was only when field staff from Proximity Finance arrived in her village that she began to see a way forward. The road in and out of the Shwe Bone Thar was in bad condition, and Ma Thi Thi Cho was impressed that the staff had come this far. Out of the 160 or so households in the village, Ma Thi Thi Cho and 80 others signed up to Proximity Finance’s small, low-interest loan program. Borrowing K250,000 per season at 2.5 percent interest, it wasn’t long before Ma Thi Thi Cho could pay back the brokers. 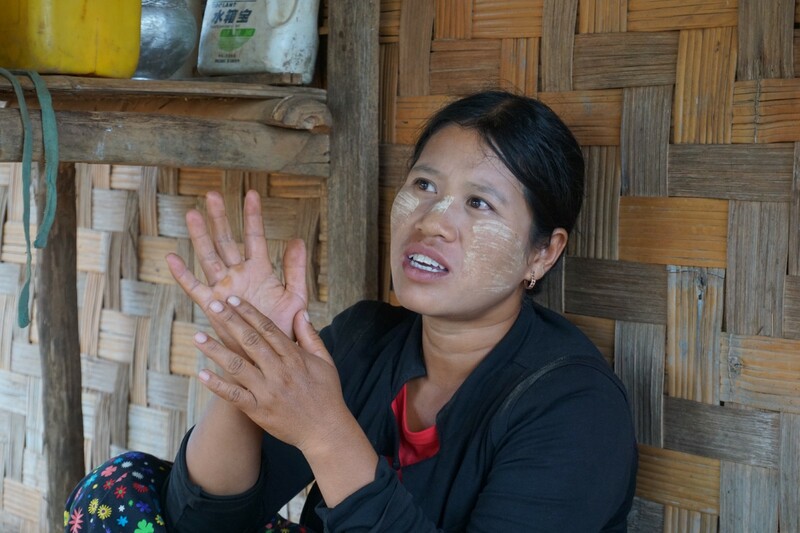 Ma Thi Thi Cho was forced to sell her produce to corn brokers at below market rate. That harvest produced a significant yield of 8,200 kilograms of corn. With the money she made selling it at the market combined with U Phoe Htaw’s wage, Ma Thi Thi Cho bought another five-acres of cornfields and four-acres of paddy. The following season Ma Thi Thi Cho took out another loan from Proximity Finance for more seed and fertilizer. She doubled her yield that harvest and this time, rather than selling it all at once, she stored most of it in a silo and sold it when demand for corn was at its highest. From this she made enough to purchase a motorbike to get around the village, two buffalos for paddy farming, a tractor, and materials to renovate the home. “My daughter is eight years old and my son is five years old. We might need a bigger and warmer house for them to grow up in, so I’m planning to renovate our house next year,” she said. With 11-acres of corn and 4-acres of paddy, Ma Thi Thi Cho has now started planting mango trees. 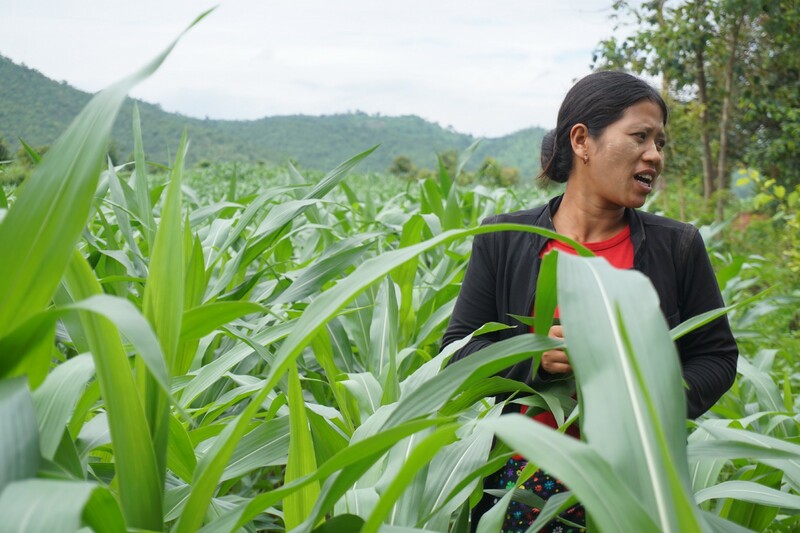 Recently Ma Thi Thi Cho begun planting mango trees in rows between the corn and with more than enough work to do around the farm, U Phoe Htaw moved back home. School in the village only goes up to middle school, so families either have to send their children away to the city to finish their education or put them to work. Even though Ma Thi Thi Cho won’t have to make that decision for some time yet, she already has a plan. “The mangoes will be ready to harvest in six or seven years, about the same time my daughter is sitting her matriculation exams,” she said.